CIAgent is a product of SNMP Research, a company that specializes in solutions for Internet and network security applications. CIAgent is a secure SNMP agent, combined with the ease of Web-based management. This standards-based agent is comprised of the EMANATE Master Agent, multiple extensions for system and application management, and a powerful (optional) subagent development kit for building custom extensions. This intelligent agent supports SNMPv1, SNMPv2 and SNMPv3. The Critical Application Monitor can be configured to carry out suitable actions when the application terminates, such as sending a trap or restarting an application. Monitor system and application logs. The Log File Monitor examines log files and performs actions when user defined patterns are encountered or when the log file exceeds a certain size. Monitor available capacity of file systems. The File System Monitor shows current file systems and sends notification when the file system reaches near capacity. In addition, it adds the ability to perform actions based on file system problems. Other functions include execution of programs or scripts and/or sending traps. The Service Monitoring Subagent (optional) is designed to determine if a service, such as a Web server, FTP server, or SMTP is working properly and whether response time is within acceptable parameters. Manage information via Web browsers. 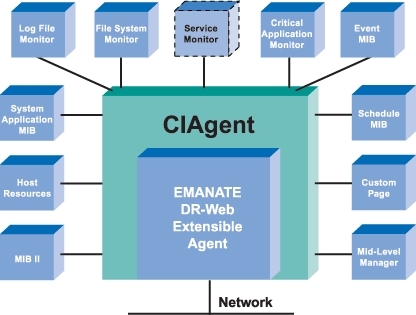 The DR-Web Extensible Agent enhances the EMANATE Master Agent, providing EMANATE with an HTTP interface. This allows Web access to the management information of CIAgent. The MIB II (RFC1213, part of STD17), a core component of SNMP agents, provides almost 200 objects of information about the performance and statistics of the TCP/IP stack. Monitor which applications are currently running. The System Application MIB (RFC2287) supports configuration, fault detection, performance monitoring, and control of application software. This agent creates tables that define an application as a series of processes and services. This includes tables that show applications installed on the system, elements and processes that are included in an application, and current and previously run applications. Monitor resources on a system. Reduce the load on centralized managers. The Mid-Level Manager (MLM) [DisMan] reduces network traffic by shifting the continual management of a machine from the enterprise manager to the local machine. The MLM uses scripts to aggregate, summarize, and transform data into useful information. This information is then reported to the enterprise manager. The MLM can be used in conjunction with any of the included MIBs to monitor objects, based on time intervals. Reduce the polling load on centralized managers. The Event MIB [DisMan] monitors MIB objects and performs actions that are based on given conditions, such as exceeding a threshold. Event MIB allows the user to configure traps that are either standard or enterprise specific. This product is based on the alarm and event tables from the RMON MIB. The Schedule MIB [DisMan] provides scheduling of actions either periodically or at specified dates and times. Build in a transition plan. The Native Agent/Subagent Adapters allow for the smooth coexistence of CIAgent and the native SNMP agent, which is provided by the underlying operating system. The Trapsend utility allows traps to be sent from the command-line or from shell scripts. Trapsend supports SNMPv1, SNMPv2, and SNMPv3. The Subagent Development Kit (optional) makes it easy to add custom subagents that support new MIB modules.